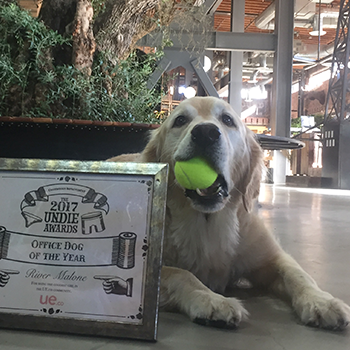 River Malone, EVP of Fetch at UE.co, is the 2x defending champion of UE.co’s Office Dog of The Year Award. Known for her unwavering puppy-eye stare and swift tail wag, River can usually be found patrolling the office for neglected snacks, lifting morale through the “woof”, and receiving treats for being a good girl. An active member of the San Diego Canine Community, River prides herself in protecting the UE.co team from cats, squirrels, and motorcycles.